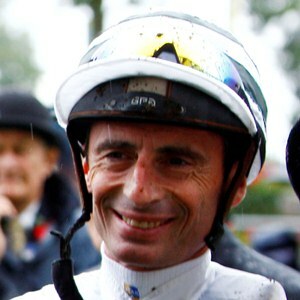 Gerald Mosse is currently one of France’s top jockeys, having first sat on a horse at the age of three. He started riding in 1983 and was initially attached to the Patrick Biancone stable. He subsequently rode for the late Francois Boutin and was retained jockey to the Aga Khan for eight years up to 2001, when he departed France for a spell in Hong Kong where he continues to enjoy great success. He won the Longines Hong Kong Vase there on Red Cadeaux in 2012. The jockey’s first major wins came in 1988, including the Prix de Diane (French Oaks) on Restless Kara, while he partnered Saumarez to land the 1990 Prix de l’Arc de Triomphe and has since recorded a string of big-race wins including three French Derbys (1994 Celtic Arms, 1996 Ragmar, 2011 Reliable Man). Indeed Mosse has won each of the French Classics at least twice. He also partnered the outstanding juvenile Arazi to five straight victories in France in 1991 and landed Australia’s most famous race, the Melbourne Cup, on Americain in 2010. He rode a superb race on Immortal Verse to land the 2011 Group 1 Coronation Stakes at Royal Ascot in June 2011, the third leg in the Fillies & Mares division of the QIPCO British Champions Series.